We’d love your help. Let us know what’s wrong with this preview of 183 Times a Year by Eva Jordan. 1 Mothers and daughters alike will never look at each other in quite the same way after reading this book—a brilliantly funny observation of contemporary family life. 16-year-old Cassie—the Facebook-Tweeting, Selfie-Taking, Music and Mobile Phone obsessed teen—hates everything about her life. She longs for the perfect world of Chelsea Divine and her 'undivorced' parents—and Joe, of course. To ask other readers questions about 183 Times a Year, please sign up. This was a great surprise to me. I went on several of my friends recommendations and the Publicist Maxine. I love reading this kind of genre once in a while, its a refreshing change and this book by this author Eva Jordan brought a breath of fresh air into my day. Teenage girls and arguments with their Moms go hand in hand. I remember when I was a teen [many moons ago] and when my daughter was growing up. Yep, loads and loads of times. So this book was a treat for me to see that its 'normal'. Trou This was a great surprise to me. I went on several of my friends recommendations and the Publicist Maxine. Trouble is, this Mother also has a stepdaughter who likes to dress as a Goth. She also has a son. This is family life dysfunctional, but growing, growing relationships, blossoming and finding themselves daughters. Rebel, rebel, be different, swim against the tide. But still want to be accepted. I read this with a lot of 'tongue in cheek' moments. Really enjoyed it because it was also very moving at times. What a delightful surprise package this was and a very good debut novel from author Eva Jordan. This is one of those books that can make you laugh and cry all at the same time and I have to say the laugh out loud moments were plentiful when I was reading this book, there are just some winning scenes that will have you in hysterics! On the other hand it's also a poignant message about a relationship between a mother and her teenage daughter and all that it brings with it. The book is light-hearte What a delightful surprise package this was and a very good debut novel from author Eva Jordan. This is one of those books that can make you laugh and cry all at the same time and I have to say the laugh out loud moments were plentiful when I was reading this book, there are just some winning scenes that will have you in hysterics! On the other hand it's also a poignant message about a relationship between a mother and her teenage daughter and all that it brings with it. The book is light-hearted and funny for the majority and exudes warmth from the pages each step of the way, when tragedy hits the family the book really pulls on the heart-strings and adds another element to the overall reading journey. This is a book that will appeal to a lot of readers and be one you can truly just escape into with your wine, coffee or hot chocolate, fluffy warm socks and your phone switched off. Be warned, if you read this in a public place laughing out loud and snorting is highly likely. The book is written with alternating perspectives and I have to say when I was in 16 hear old Cassie's head it was so well done, she really could be just about any 16 year old girl in the modern world. Very funny stuff. Mothers will relate to Mum Lizzie and all that she goes through with her not so functionally perfect family. I certainly did. It's just a little bit of a special book. Before you know it you will be finishing the book and feeling quite satisfied with the journey. I enjoyed reading this great debut novel and give it 4 stars without hesitation. Recommended reading. NOTE: I have review copies of this book available! Contact me if interested, my regular reviewers can find it on the book order form. A fun debut novel about a blended family, extended family, friends, boyfriends, love affairs, hangovers and the generally high level of frustration that occurs when families, especially blended families, are faced with teenaged-angst and mid-life crises all at the same time. The chapter viewpoints change between many characters, and the voices ring true for the various ages and genders. Cassie, the 16-year-old, is the funniest—bright, good student, musical—but disruptive. She wants to be in with the rich crowd, the ones with fake everything, the ones who keep tweeting about overseas holidays. She is the mistress of malaprops. She refers to having “a real dyslexic (or is it electric—whatevs) taste in music”. She has also credited Shakespeare with writing in both Islamic and imbecilic pentameter. Lizzie, her mother, is a librarian with a degree in English and just can’t help correcting her daughter. She is an attractive 45-year-old (an ancient crone, to Cassie) who cops the brunt of the tears and tantrums from Cassie and the moody silences from goth step-daughter Maisy – sorry—‘Mania’ (newly self-christened), a year older than Cassie and who can drive, so is often mysteriously independent. Cassie’s just finishing school, and Lizzie has discovered her in a wailing frenzy, searching for her missing Student ID (required for an exam). Lizzie’s first husband was a rat who exchanged her and their two kids for a rich wife who wants nothing to do with the kids, while her current husband, Simon, is a nice bloke. They share a lot of 80s nostalgia—music, clothes, dancing—with old friends. Lizzie is still quite passionate about political issues and these crop up at some length throughout. After the family suffers a tragic blow, the mood changes and some cats are let out of unexpected bags. I read about a third of the copy I was given and gave up, too often side-tracked by errors (stray apostrophes in all sorts of places) that I itched to correct, BUT . . . I was asked to give the whole book a go, and I’m glad I did. I didn’t remember it was a debut novel, and other than the irritating typos and such, the writing is so smooth and easy that it didn’t raise the little flag that says “amateur”. Instead, I was no doubt too harsh because I’d read it immediately after a book that had been longlisted for the Man Booker Prize (Us), and the about-to-be-published book, My Name Is Lucy Barton by Pulitzer-Prize-winning author Elizabeth Strout —hardly fair competition! I seem to be swimming against the tide with my views on this book, which I am awarding 2 1/2 stars. I feel a little ambivalent about this book. While I can relate strongly to both the main characters, Lizzie and Cassie, I felt the writing let the plot down. Told from multiple POV, this is the story of Lizzie, her partner Simon, and their blended family of teenagers Maisy and Cassie and pre-adolescent Connor. It is a story of growing up, growing older, of parenting and absent parents, of friendshi I seem to be swimming against the tide with my views on this book, which I am awarding 2 1/2 stars. I feel a little ambivalent about this book. While I can relate strongly to both the main characters, Lizzie and Cassie, I felt the writing let the plot down. Told from multiple POV, this is the story of Lizzie, her partner Simon, and their blended family of teenagers Maisy and Cassie and pre-adolescent Connor. It is a story of growing up, growing older, of parenting and absent parents, of friendships and falling out, of loving in sickness and in health, of the tragedy and triumph of life. However, the constant use of "like", "well" and "sick" marred my enjoyment. I found it to be like, well sickening. It is something that will 'date' this book very quickly. I also found irritating Cassie's lack of knowledge of common sayings; e.g. "I'm all ears." No doubt she has grown up listening to her mother trotting out these common sayings, but she professes ignorance. Her 'misuse' of words is somewhat overdone. After all she is not five years old. She is a reasonably intelligent (Judging by her exam results) teenager. Yet the book is peppered with "Gawjuss" (I mean, like, really! ), and other silly things like "ouzo layer" and "glowball warming". There is more than one instance of their and they're being confused. Parts of the book I found heartwarming, and others just plain humdrum. I skimmed large sections, which I rarely ever do. Not a read I would recommend. Thank you to Catlady Booklover and VIP reviews for a copy of this book in exchange for an honest review. I still can't believe 183 TIMES A YEAR is a debut novel. Eva Jordan has done a wonderful job detailing the difficult relationship between a mother and a teenage child. As the mother of a 13 year old daughter, I could totally relate to how Lizzie was feeling and the frustrating times she had with Cassie. While reading 183 TIMES A YEAR I found myself laughing out loud to the point that I was snorting! I love when an author can do that to me. I spent the afternoon on the couch with this wonderful story and could not put it down. I was actually thinking of myself when reading some of the antics that Cassie tried to pull. Every mother of teenage children will instantly feel a kinship with Lizzie. When Eva Jordan asked me if I'd like to read and review her book and told me it was about a mother with teenage daughters, I couldn't really refuse! As it turns out, I am exactly the same age as Lizzie, the mother in the book, and my oldest daughter is the same age as Cassie. There was so much in this book that I could identify with from Lizzie's thoughts about her daughters and the behaviour of the terrible teens! If you are intrigued by the title of the book as I was, you do find out and I mus When Eva Jordan asked me if I'd like to read and review her book and told me it was about a mother with teenage daughters, I couldn't really refuse! As it turns out, I am exactly the same age as Lizzie, the mother in the book, and my oldest daughter is the same age as Cassie. There was so much in this book that I could identify with from Lizzie's thoughts about her daughters and the behaviour of the terrible teens! If you are intrigued by the title of the book as I was, you do find out and I must say I think it may be an underestimate! Right from the opening part of the first chapter - which is very cleverly written, you'll know what I mean if you read it - I knew I was going to enjoy this book. I recognised so much in Lizzie as she described a bit about her own teenage years in the 80s, it was like reading about my own: watching Top of the Pops so you could chat about it with friends, reading Are You There God, It's Me Margaret by Judy Blume - it evoked lots of memories. I have to say that my two teenage girls are lovely but like any mother of teens I knew exactly how Lizzie felt about being almost frightened to say anything in case it was the wrong thing. Cassie is sitting exams as my eldest did this year and you really have to tread a fine line when being encouraging - you're either being patronising or putting pressure on! There were so many laugh out loud moments in this and one which particularly struck a chord was when Lizzie explained why she didn't like to go shopping with Cassie. She says "quite simply I have turned into my mother. Not the calm, older but wiser version of late but the one who blurts out comments like 'how short?' or 'is that a top or a skirt' or 'how much?' ". I honestly felt I was reading about myself. Or perhaps that's just what happens to all mothers of teens. It was funny reading Cassie's thoughts about her mum too and how she was so uncool, and annoying and generally so old. I remember having those thoughts too and yet here I am, the annoying old mum! I thought that the author did a great job of really capturing the voices of both her main characters. For all it's a very funny book, it's not without its serious moments. A betrayal is revealed which threatens one of Lizzie's friendships and a serious incident makes the last quarter of the book a much more sombre read. But what comes out of this is that Lizzie's family, despite its arguments and differences, really pulls together and shows its strength. In the very last part of the novel there are some very moving and thought-provoking phrases, including this one: "If you spend your life craving the seemingly perfect lives of others you are in serious danger of missing what you actually have. Wanting deprives us of contentment and happiness". Very true, Ms Jordan, very true. There are times when I agree to a book and it just sits on my TBR shelf on my kindle, then when I do eventually get around to reading it I could kick myself for not getting to it sooner 183 Times A Year is such a book. This is a story of a family, well two families actually that through circumstances come together to live as one, they are step families. Teenage daughters, a younger son and two parents trying to support each other in this family unit, oh and grand parents. Drama and hysterics from There are times when I agree to a book and it just sits on my TBR shelf on my kindle, then when I do eventually get around to reading it I could kick myself for not getting to it sooner 183 Times A Year is such a book. This is a story of a family, well two families actually that through circumstances come together to live as one, they are step families. Teenage daughters, a younger son and two parents trying to support each other in this family unit, oh and grand parents. Drama and hysterics from the teenage girls, drama from friends and lack of drama from an absent father add an interesting cocktail of emotions into this story. As I have already mentioned, I could so kick myself for not reading this sooner, the only time I stopped reading this book was to make another cup of coffee, only to let it go cold again.... It is a beautiful, heartbreaking, emotional, realistic and wonderfully written story of Lizzie and her family, Lizzie is the mum by the way. The author has broken the story down into chapters with sub chapters and tells the story from the perspectives of mainly Lizzie and her daughter Cassie, though other family member do have the odd spotlight moment, each of these sub chapters had their own title of the character who was telling the story, but to be honest I soon got to know the characters so didn't actually look at these headings. This for me was the moment I realised how well the author had allowed me to get to know the characters, she had given each one their own individuality, style and their own voice. The story itself is about angst, rebellion, pushing the boundaries and the teenage world of "my life is so unfair". But it is also about a mum working, running a home and the children to various events as well as keeping home. It portrays life for many families who have to juggle many balls, with a dad who is caught up in the middle of trying to keep the peace and support everyone. What made this story so special for me was how the author had created an addictive read from what is essentially an everyday life for many families. She has accurately captured the emotions and struggles and managed to blend in a certain amount of humour. There are elements from three generations that work so well, they have been balanced to create a realistic and very believable story that had me knowingly nodding my head at some of the scenarios, grinning and smirking at others as life, school, work and boyfriends are explored. I absolutely loved this book from the very start to the last pages, I didn't want to leave and was gutted when I finished the book. It had me grinning one moment, frowning the next and at one point absolutely crying ugly. This is a story that I would absolutely highly recommend to readers of women's fiction, contemporary and literary fiction with a focus on family life. This was a real fly on the wall sort of read as it looks at every day life of a ‘blended family’ as they go day by day in their ordinary lives. I feel so darn lucky as I can’t remember having stand-off situations with my parents and didn’t have any with my two daughters or step daughters either. What I was shocked with as a parent was finding out how many times I survived on a wing and a prayer. I always thought my mum knew all the answers, believe me as a mum myself for a number of years, I kno This was a real fly on the wall sort of read as it looks at every day life of a ‘blended family’ as they go day by day in their ordinary lives. I feel so darn lucky as I can’t remember having stand-off situations with my parents and didn’t have any with my two daughters or step daughters either. What I was shocked with as a parent was finding out how many times I survived on a wing and a prayer. I always thought my mum knew all the answers, believe me as a mum myself for a number of years, I know I didn’t I just blagged it because most of the time it was all guess-work. I am almost 61 it is still guess-work. I loved Lizzie and Cassie and the frustrations of them both, Lizzie really wanting everyone just to help a little more and Cassie seeing the chores as ‘things that mum enjoys doing’, that is just classic, love it. I giggled and chuckled, especially when Cassie constantly used wrong words to describe things, even at the most inopportune moments. The grass was so much greener for Cassie as she so wanted to be in with popular groups in school and leave childhood behind. She has far more to her than she is given credit for. The story does of course cover the whole family as Lizzie also has a son Connor and stepdaughter Maisy. It is the whole package of mix family problems. Simon is the rock in the house and clearly loves Lizzie and all the kids. There are Grandparents and a reluctant maternal dad in the picture too. There are betrayals of all kinds from every angle for a few members of the family. I thought the ordinariness of the whole story to be the magic that made it so special, an instant connection to the family dynamics. Most families face tragedy of all sorts of degree at some time and this family was no different. I think that it is here that author Eva Jordan’s novel went from an entertaining read to brilliant. The changes in the family were captured to perfection. It was a life changing event that hit all of them. I feel that with my penchant for twisty thrillers, and heart wrenching contemporary books, that I don’t get enough fun in my reads. Thankful this book is the antidote to that. It is loaded with laugh out loud moments that had my stomach in a knot. The book features Cassie, an angst-ridden, stroppy teenager, and Lizzie, her over-worked, under-appreciated mum. We often get the same scene retold from both their points of view, with hilarious results. Lizzie tries hard to mother her extended family wi I feel that with my penchant for twisty thrillers, and heart wrenching contemporary books, that I don’t get enough fun in my reads. Lizzie tries hard to mother her extended family with love and compassion. But she is no superwoman, and often ends up shrieking like a fishwife. And my younger self can relate so much to teenage Cassie with all her self-doubt, and insecurities. And incessant door slamming! I loved both characters so much, and enjoyed their character growth. As well as being a scream of a read, it is also full of poignant, very relatable moments of family life in the twenty tens. 183 times a year is reportedly the number of times it is normal for a girl to argue with her mother. Unfortunately for Lizzie it seems more like 183 times a day! Not only does she have her own angst ridden teenage daughter Cassie to contend with, but also her Goth like teenage stepdaughter Maisy (or Mania as she insists on being called). Her son Connor, who has yet to discover his hormones, happily co-exists with all the mayhem and is almost oblivious. Connor and Cassie are Lizzie's children by 183 times a year is reportedly the number of times it is normal for a girl to argue with her mother. Unfortunately for Lizzie it seems more like 183 times a day! Not only does she have her own angst ridden teenage daughter Cassie to contend with, but also her Goth like teenage stepdaughter Maisy (or Mania as she insists on being called). Her son Connor, who has yet to discover his hormones, happily co-exists with all the mayhem and is almost oblivious. Connor and Cassie are Lizzie's children by her first marriage, and therein lies much of the source of the arguments and disruption as her ex husband is really only interested in his new family, so Cassie vents her spleen at home. I really enjoyed this book. It really grasped the nature of mother/daughter relationships very well, in a way that was funny but also at times, touching and poignant. As I don't have children I've never suffered the 'joys' of teenagers, however, although it may have been quite a while ago, I still remember what it was like to be one. If I'm honest I suspect I was probably quite a little Cassie myself, so for that - sorry Mum! The joy of this book is that there were many reference points that struck a personal chord. Lizzie's reminiscences of her own younger/teenage years could well have been my own as I too was always going to be Mrs David Cassidy - he just needed to meet me! The angst of the teenage years, of fitting in and being accepted, are all feelings we will recognize. The importance of the correct clothes, the choice of music, watching the right programmes, reading the correct books. Whether you were a 'Lizzie' or have a 'Cassie' this book will resonate. The book isn't solely about teenage relationships, it deals with many other contemporary issues such as the changing nature of the family unit, work practices, friendships, illness and infidelity to name a few. While the general tone is upbeat, it doesn't shy away from dealing with more serious topics, and drifts into darker territory towards the end. That said it still maintains a lightness that makes you think about the important things in life, rather than concentrating on the things that are send to try us. Well I am completely and utterly speechless, I'm going to attempt to review this book but I'm pretty sure I won't do it justice as there are just no words to explain how riveting and amazing this book is. The story and its well written characters, draws you in and gets you engrossed right from the very first pages and keeps you ensnared within its grip right to the very last words of the very last page. The story is mainly based around family life and all that goes with it, the ups and the downs, Well I am completely and utterly speechless, I'm going to attempt to review this book but I'm pretty sure I won't do it justice as there are just no words to explain how riveting and amazing this book is. The story is mainly based around family life and all that goes with it, the ups and the downs, and it deals with some real life issues that really make you think about certain aspects of life. It was at times a highly heartfelt and emotional read. There were certainly a fair few laugh out loud moments, certain things that the characters do or some of the words that they come out with, sure did make me giggle in places. I absolutely loved reading this, could not turn the pages quick enough, and as for the last few chapters, well my heart was literally in my throat, in anticipation of the outcome and how it would all end. How can you not give this book five stars? I have three daughters and as I read, I could completely relate to the thoughts of Lizzie the mother and Cassie the daughter. Let's face it daughters are very strong-willed and fast with their tongue, but on the flip-side they are very loving and there when you need them. I wouldn't give my girls up for the world. It was a very humorous book until the tragedy strikes and the tears of joy, turn to tears of sadness. The scenes were depicted so well, it fel How can you not give this book five stars? I have three daughters and as I read, I could completely relate to the thoughts of Lizzie the mother and Cassie the daughter. Let's face it daughters are very strong-willed and fast with their tongue, but on the flip-side they are very loving and there when you need them. I wouldn't give my girls up for the world. It was a very humorous book until the tragedy strikes and the tears of joy, turn to tears of sadness. The scenes were depicted so well, it felt like I was right there with this family, enduring the pain. This was a well-written book and it will tug deep into your emotions, making you laugh and crying, sometimes in the same scene. But you will walk away appreciating your life more and how lucky you are to have family. I really liked this one. It had so many funny things and I recognized many of them. On the other hand a lot of sad things happened as well and I have to say the author truely knows how to describe feelings. She pulls the reader into her story. Add to this mixture some love, the revealing of a few secrets and a bit of heartbreak and a fluent writing style and you end up a most enjoyable book. This is one of the funniest, but touching, books I have ever read. Lizzie has a boy and a troublesome teenager by her first marriage and “an Emo” from her husband’s marriage. Their life together provides some hilarious and some poignant moments. I love how her daughter Cassie suffers spoonerisms and malapropisms which are hilarious. ”Aunt hissie fit” instead of antithesis”. Lizzie is trying to get across to her children that money isn’t everything, as isn’t image and “being with the in-crowd”. O This is one of the funniest, but touching, books I have ever read. Lizzie is trying to get across to her children that money isn’t everything, as isn’t image and “being with the in-crowd”. One quote in particular stood out for me-“The desperate and the soulless trying to impress the deluded and barren with their misguided aspirations”. A classic, when children (or adults) think that materialistic things and money are the most important at the expense of all else. This book tells the story of real life and holds up morals and ethics between its pages. The story is told from different characters’ perspectives. One brilliant one is that Maisy all the way through, we are told, is that she only ever speaks 3 words a day to Cassie. I will leave you to read her “chapter”. This is a very enjoyable book for everyone who has had/got/not got teenagers. We have all been there to one extent or another- even if only having been one ourselves. This is stunning, thought provoking writing. Well done Eva Jordan- you are one talented lady and I look forward to reading more from you very soon. A rare 5* from me and very well deserved. I received a free copy of this book in exchange for an open and honest review. 183 Times A Year is the authors debut novel. As debut novels go, this one is rather special. I love how the story starts off, it flicks between Lizzie (mother) and Cassie (daughter)and I very much enjoyed reading their thoughts about each other and their lives. At last I feel like my family are normal! It starts off being a really humorous read as the author pulls off the stroppy and troubled teen as well as the mother role perfectly. It reminded me so much of myself as a teen and now as a mother 183 Times A Year is the authors debut novel. As debut novels go, this one is rather special. It starts off being a really humorous read as the author pulls off the stroppy and troubled teen as well as the mother role perfectly. It reminded me so much of myself as a teen and now as a mother with a 16 year old daughter, I can totally relate to what Lizzie is going through. As the story goes along though it gets a more serious feel to it. I was totally enthralled by the whole story line, I absolutely loved every part of it. After a horrible tragedy the story got a lot more emotional for me. Through Cassie and the other family members, I felt like I was going through all the emotions that they were going through. I cried tears of sadness as well as laughter. By the end, it really does make you appreciate your family so much more. It also reminded me never to take anything or anyone for granted. This is a novel that every adult and teen should read. I think it would give both age groups a better understanding of each other. More than anything though the author has captured 100% the whole family life as it is in the modern day. It truly is a wonderful book that really is a must read. I'm so glad I took a chance on this book, when I read the description I was curious but not entirely sure if it was the book for me. A funny, entertaining and light hearted read for most parts, the reader is introduced to a typical dysfunctional family, a mother nearing the end of her tether with her teenage daughter and stepdaughter, and worrying her delightful son will find his hormones and will turn into another moody teen. Throw in her ex husband who seems to have abandoned the kids almost co I'm so glad I took a chance on this book, when I read the description I was curious but not entirely sure if it was the book for me. A funny, entertaining and light hearted read for most parts, the reader is introduced to a typical dysfunctional family, a mother nearing the end of her tether with her teenage daughter and stepdaughter, and worrying her delightful son will find his hormones and will turn into another moody teen. Throw in her ex husband who seems to have abandoned the kids almost completely, her new partner working away from home a lot so not able to support her when it comes to the kids, it's no wonder that Lizzie needs the help of good friends and wine to keep her sanity. Lizzie is a fantastic character, her quirkiness makes her leap off the pages and seem so real. I can see traces of my own mother in her, and I can see myself already following down some of the pathways taken by Lizzie, especially talking out loud to myself and having a full blown conversation half inside my head and aloud. Cassie is the typical 16 year old, her life revolves around what others think of her, her social status and making sure everyone knows that life isn't easy when you're 16. She's a character that I think most people can see traces of themselves in, I know I certainly can and I really need to apologise to my mother for that - amazing I made it through teenage years without any injuries! The narration from alternating perspectives of Lizzie and Cassie is incredibly well written. It gives the reader a great insight into each character, but it also opens the characters up even more, makes them even more relatable. The writing is superb, for a début novel I was impressed. I particularly liked how Eva Jordan dangled the implication of there being more to a situation but not giving all the details away at that time. Doing this ensured that my attention was held captive by her storytelling but also, illustrated that Jordan has quite a talent for writing. I would definitely say this is a book that both teenagers and adults should read, it relates to so many issues cleverly whilst telling a heart warming story. Most importantly though, it reminds us not to take others for granted and appreciate the things that others do for us - even if it is just emptying the dishwasher or taking cups from the bedroom before they start to grow penicillin cultures. From the opening pages of this wonderful book I knew I was about to read something special, so I gleefully hopped aboard the emotional rollercoaster that is 183 Times a Year. The story is told mainly from the perspectives of Lizzie (mum) and Cassie (daughter) and Eva Jordan effortlessly changed writing style to step into these very different shoes. We are privy to so many of their innermost thoughts, or outermost in Lizzie's case as she often talks out loud, that I felt like I was seeing the wor From the opening pages of this wonderful book I knew I was about to read something special, so I gleefully hopped aboard the emotional rollercoaster that is 183 Times a Year. The story is told mainly from the perspectives of Lizzie (mum) and Cassie (daughter) and Eva Jordan effortlessly changed writing style to step into these very different shoes. We are privy to so many of their innermost thoughts, or outermost in Lizzie's case as she often talks out loud, that I felt like I was seeing the world through their eyes. At times, I laughed so much that I cried, but as with all ups and down of family life my tears of laughter turned into tears of despair as events unfolded. I completely bought into the characters and felt like I knew them inside out and I was just settling in to the family life and putting my slippered feet under Lizzie's table, when tragedy struck. Reading the thoughts of other family members had me reaching for my tissues; in particular, Maisy (aka Mania) - I have never known one simple line bring me to tears. Eva Jordan is an absolute genius - she knows how people tick, both young and old. This book really had me considering my own actions and reactions. How we often hit out at those closest to us and how our actions don't always reconcile with our feelings. It's only in the face of tragedy that our real feelings reveal themselves, but for many people this can be too late. To be able to write from such different perspectives is an amazing feat and I urge you to head over to Amazon to read 183 Times a Year for yourself, then tell your Mam/Mum/Mom/Mother that you love and appreciate her. Thank you Eva, this wonderful debut novel is such a candid account of family life that we can all relate to. Be prepared to laugh and to cry, this book is so full of surprises that it's worth reading all over again. An absolutely astonishing, thought provoking, hilarious and life affirming debut novel. So what does 183 Times a Year mean? You'll just have to read the book to find out! I really loved this. I needed a break from all the doom and gloom in the books I usually favor and this was perfect. I laughed out loud several times and had a hard time putting it down. I cried too. You really get to know the characters and feel for them. Even though I'm getting to the age where I roll my eyes at some things the teenagers in the books do! Lizzie is the mother to what she accurately states Americans call "a blended family". She has a teenage daughter, Cassie, and a young boy call I really loved this. I needed a break from all the doom and gloom in the books I usually favor and this was perfect. I laughed out loud several times and had a hard time putting it down. I cried too. You really get to know the characters and feel for them. Even though I'm getting to the age where I roll my eyes at some things the teenagers in the books do! Lizzie is the mother to what she accurately states Americans call "a blended family". She has a teenage daughter, Cassie, and a young boy called Connor. Having divorced her first husband, she found a man named Simon who has a teenage girl of his own, only slightly older than Cassie named Maisy. This book portrays the tremulous relationships between teenagers and their parents... the slammed doors, stress, fights, and unappreciative children... along with the loving moments that make the whole thing worthwhile. Lizzie soaks in the sweet, uncomplicated love and affection she gets from Connor while knowing that when his teenage years hit, he's likely to be as much trouble as the young ladies of the house. It's very honest from the first line of the book. They're not perfect and they don't pretend to be. When tragedy strikes the family, it could bring them closer and solidly their relationships with each other or tear them apart. You have to appreciate what you have... because you won't have it forever. This book is a really emotional, enjoyable story and I'm glad I had the opportunity to read it. This was a light read, filled with a wide variety of quirky, dysfunctional characters and infused with many humor filled moments. This book is about relationships and how people find each other, and their way and purpose in this world. At the beginning, many of the characters were very self absorbed and difficult to like. In this extended and blended family, communication often suffered due to extreme busyness, self absorption and obsessions with social media and cell phones. Family members loved This was a light read, filled with a wide variety of quirky, dysfunctional characters and infused with many humor filled moments. This book is about relationships and how people find each other, and their way and purpose in this world. At the beginning, many of the characters were very self absorbed and difficult to like. In this extended and blended family, communication often suffered due to extreme busyness, self absorption and obsessions with social media and cell phones. Family members loved and yet disliked each other. A state of disharmony had become the norm. Lizzie is a modern woman who wears many hats. She is a wife, ex-wife, mom, step-mom, daughter, friend and co-worker. As Lizzie lives her life, juggling her many roles, she and her loved ones experience happiness, sadness, routine, danger, quarrels, harmony, dependence, independence, frustration, gratitude, like, love and even a bit of magic. This book was sprinkled throughout with many funny moments. My favorite was when Lizzie was attempting to eat a meal that had been lovingly prepared by her culinary challenged children. I so enjoyed laughing along with Lizzie, Conner and Cassie. After a horrible tragedy struck, the whole tone of the story changed and deepened. The characters began to relate to each other in more meaningful ways and I began to care more for them. Thank you Helen (from TBConFB) and the author herself Eva Jordan, for my ARC copy which i received through TBConFB in exchange for an honest review. I like the premise of the book, A mother / daughter relationship, a blended family, all of which I am a part of myself. So I was really looking forward to reading this. On the whole I did enjoy this story. I could relate to the mother, Lizzie as an individual. I found a few similarities between my daughter and I. It was an easy read, the author ha Thank you Helen (from TBConFB) and the author herself Eva Jordan, for my ARC copy which i received through TBConFB in exchange for an honest review. On the whole I did enjoy this story. I could relate to the mother, Lizzie as an individual. I found a few similarities between my daughter and I. It was an easy read, the author has a lovely, flowing style of writing. As a result, it didn't read as a debut novel (it is not at all obvious and if I'd just picked it up randomly I'd never have guessed) So all credit to the author for this, as it's an accomplishment in itself. My only real criticism (and it IS only my opinion) in this novel is the language and vocabulary of Cassie, the daughter. I have children myself of a similar age and I just couldn't connect with her at all. The words, expressions & general language used, i.e. "sic" I have never heard mine use. They've used the "what evs" from time to time but that's about it. This review is purely my own personal view, and yes, on the whole I enjoyed it and yes, I would recommend to others. I look forward to the authors next book as if she can produce this calibre of writing as a first novel, she'll definitely be one to watch. 183 Times a Year is a story about an ordinary family and their everyday issues. Full of emotion, humour, hope and and sadness. My preferred genre is crime and psychological thrillers. However, this book came highly recommended, and sometimes I like to cleanse my reading palette. I was worried this book would be too slow for me, with nothing happening that I could sink my teeth into. But I was pleasantly surprised; by time I was 50% in it really picked up and kept me reading - I was interested in 183 Times a Year is a story about an ordinary family and their everyday issues. Full of emotion, humour, hope and and sadness. My preferred genre is crime and psychological thrillers. However, this book came highly recommended, and sometimes I like to cleanse my reading palette. I was worried this book would be too slow for me, with nothing happening that I could sink my teeth into. But I was pleasantly surprised; by time I was 50% in it really picked up and kept me reading - I was interested in the characters, their stories and their lives. The author does an amazing job of writing between mother and daughter. I thought her use of language was brilliant, and I could really hear the daughter's voice - although I wanted to shake the tantrums from her! 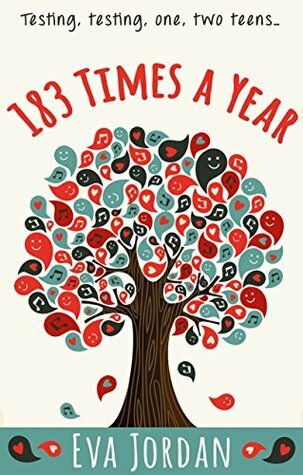 I felt quite a few emotions while reading 183 Times a Year, some I didn't expect, and I'm very glad I read it. I highly recommend it to readers who enjoy contemporary fiction. Thanks to Eva Jordan and TBC on FB for the opportunity to read this delightful book. After the first few pages, I thought this could be my household, but with two boys instead of the two teenage girls. However, when I read on I realised that the girls were so much worse than my boys and Mai...oops Mania and Cassie were far more demanding! The author had a clever way on more than one occasion of leading you to come to one conclusion which rapidly changed and left you gasping with a sudden realisa Thanks to Eva Jordan and TBC on FB for the opportunity to read this delightful book. After the first few pages, I thought this could be my household, but with two boys instead of the two teenage girls. However, when I read on I realised that the girls were so much worse than my boys and Mai...oops Mania and Cassie were far more demanding! The author had a clever way on more than one occasion of leading you to come to one conclusion which rapidly changed and left you gasping with a sudden realisation that it was something else altogether. An amazingly well written debut novel by Eva. Luckily my husband heard her interview on local radio, came home and told me. As a mum of a teenage daughter and son, I could relate to this book. Having been a teenager I could relate from Cassie's point of view. This book had many laugh out loud moments, great relationships, and also some more deep meanings, storylines to be unearthed along the way. A well written and balanced novel. The trials of a family and step family. I started reading this book and thought NO! It's written in the first person - I'm going to hate it! But I persevered and soon changed my mind. 183 Times A Year made me laugh and cry. It reminded me of the arguments I used to have with my mum when I was growing up and also of the rows with my daughter when she was a teenager. Thanks to TBC and Eva Jordan for giving me the book to review. I would thoroughly recommend this book 5/5 stars! This is not my usual genre but i'm so glad I read this book. What a wonderful refreshing book. I had many laugh out loud moments reading this but at the same time it was very touching. A well written and enjoyable read. I loved it. Many thanks to the author and TBC for the ARC in exchange for an honest review. A great book about family life that made me laugh & cry. Thanks to TBC for the copy in exchange for an unbiased review. I have no hesitation in awarding this amazing book a heartfelt 5 stars. To my eternal shame, it had been sitting on my Kindle for over a year, getting pushed out by other books that were on deadlines to be read and I feel bad about that. I am lucky enough to already have the sequel on my Kindle ready to read so to be able to read these two books, one after another, is a real privilege. Before I get stuck into reading All the Colours in Between, however, I had better review THIS book! Lizzie is li I have no hesitation in awarding this amazing book a heartfelt 5 stars. To my eternal shame, it had been sitting on my Kindle for over a year, getting pushed out by other books that were on deadlines to be read and I feel bad about that. I am lucky enough to already have the sequel on my Kindle ready to read so to be able to read these two books, one after another, is a real privilege. Before I get stuck into reading All the Colours in Between, however, I had better review THIS book! Lizzie is living with the lovely Simon, her two kids, his daughter and a moody cat (aren't they all? lol), in a pretty average home, in the suburbs. The parents work hard, the teenage girls are hard work and the elderly parents are a bit of a worry - a life so many of us middle-aged mums lead. There is a lot that goes on in this family though; secrets and lies, romances, love and a bit of magic. The author does a wonderful job of telling the story from the different points of view of the characters and many times the voice of Cassie sounds like the voice of my daughter as well, at least when she was deep into her teenage years. Some of what she says makes me cringe and takes me right back! I love Lizzie, she is a kind and caring mother, overworked and taken for granted in so many ways. At the heart of the whole book is a deep and enduring love that all of them have for one another, even if it is well hidden at times! Eva Jordan is a master storyteller, that's for sure, and I can't wait to get stuck into the second book. A solid 5 stars from me, I loved it! I voluntarily reviewed this book, all opinions are my own. Thank you to THE Book Club for the recommendation. Eva Jordan, born in Kent but living most of her life in a small Cambridgeshire town, describes herself as a lover of words, books, travel and chocolate. She is also partial to the odd glass or two of wine. Her career has been varied including working within the library service and at a women's refuge. She has had several short stories published and currently writes a monthly column for a local maga Eva Jordan, born in Kent but living most of her life in a small Cambridgeshire town, describes herself as a lover of words, books, travel and chocolate. She is also partial to the odd glass or two of wine. Her career has been varied including working within the library service and at a women's refuge. She has had several short stories published and currently writes a monthly column for a local magazine. Eva also works on a voluntary basis for a charity based organisation teaching adults to read. However, storytelling through the art of writing is her passion and as a busy mum and step mum to four children, Eva says she is never short of inspiration! As well as writing, Eva loves music and film and of course she loves to read. She enjoys stories that force the reader to observe the daily interactions of people with one another set against the social complexities of everyday life, be that through crime, love or comedy.